December 21, 2017 By Todd Burgreen & filed under All Articles, Handguns, Weapons. Eagle Imports is well known for their manufacturing and import efforts, which give the U.S. consumer opportunities to own weapons that would not normally be available via other domestic manufacturers. The latest offering from Eagle Imports that is attracting attention is a handgun designed and manufactured in the Slovak Republic by the Grand Power Company, whose origin can be traced to the early 1990s when its owner, Jaroslav Kuracina, drew his first handgun sketches during university studies. 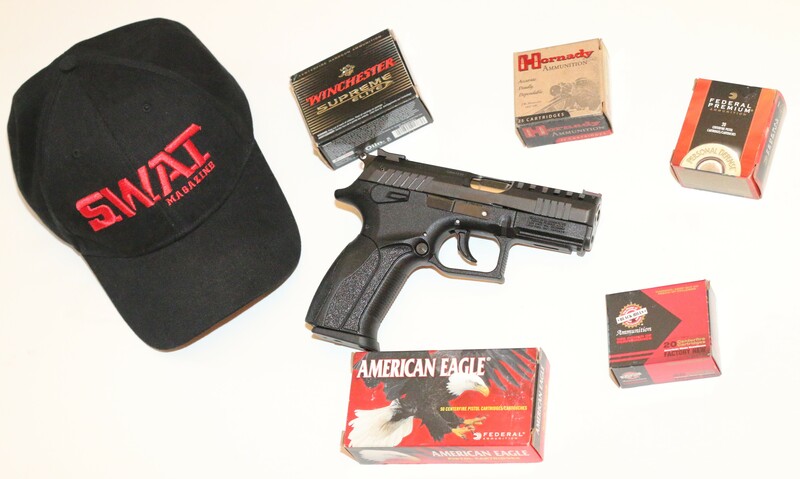 The specific model designation of the handgun evaluated is the P1 Ultra chambered in 9mm. The P1 Ultra is the continuing evolution of Grand Power’s K100. Fieldstripped P1 Ultra showing steel chassis embedded in polymer frame. Chassis provides slide rails, crosspin, and feed ramp, provides reinforcement for the frame and contributes to the overall reliability and strength of Grand Power design. The Grand Power P1 Ultra 9mm is centered on a 4140 steel reinforced polymer frame and chrome-nickel molybdenum slide with a significant design emphasis on ergonomics for ease of function. The barrel, slide, and other metal parts are treated with Tenifer coating, which hardens the metal components and increases resistance to corrosion. The black polymer frame of the P1 Ultra houses a steel chassis that contains the slide rails, crosspin, trigger group, and a feed ramp for the barrel. The frame is generally smooth with raised textured panels on the sides and rear of the grip area. Horizontal grooves adorn both the frontstrap and the forward face of the squared-off trigger guard. Material has been relieved where the trigger guard connects to the grip, allowing the shooter’s hand to sit as high as possible on the P1 Ultra. In other words, the P1 Ultra sits low in the user’s hand. This assists in limiting muzzle flip during recoil. The frame also features an extended beavertail to help prevent hammer bite. Each pistol has an integral Picatinny rail dust cover and comes with interchangeable backstraps to accommodate individual shooter requirements. The P1 Ultra is ambidextrous, with the slide lock, magazine release, and safety fully functional on both sides of the frame as it arrives in the box, with no modifications required. The barrel is stainless steel and uses a patented rotating lock, rather than the more familiar Browning-designed tilting method as found on the 1911, Glock, and many others. The P1 Ultra employs a double-action/single-action (DA/SA) trigger with an external hammer. A long trigger pull on the first shot both raises and releases the hammer, with subsequent shots resorting to the shorter single-action trigger mode. The DA/SA trigger has a very short reset for its type, which is more conducive to accurate and fast shooting. Safety can be engaged on Ultra with hammer down or rearward. The safety system of the P1 Ultra is a combination of an external manual safety and an internal passive firing-pin block. The latter is a spring-loaded, plunger-type block that is disengaged when the trigger is pulled to the rear. The P1 Ultra’s manual safety is located at the rear of the frame and requires a downward sweep to disengage, similar to a 1911. The safety can be engaged when the pistol’s hammer is in the cocked position, enabling “cocked and locked” carry for those who desire it, as well as when the hammer is lowered. The safety does not lock the slide shut, which enables the safety to stay engaged while manually working the slide. The Grand Power external safety does not have a decocking function. To fieldstrip the P1 Ultra, a tab above the trigger guard is pulled downward. With this actuated, the slide moves farther to the rear than normal, and the slide can be lifted up and off the frame. The P1 Ultra is a shorter, compact version of the original Grand Power Company K100 creation mentioned earlier. The P1 Ultra features a shorter slide and barrel, so it is a viable choice for concealed carry. The P1 Ultra’s barrel measures 3.66 inches and the pistol has an overall length of 7.38 inches. Weight is 24 ounces. The scalloped slide aids in weight savings. A fiber-optic front sight and windage-adjustable rear sight ride atop the slide. The P1 Ultra comes with two 15-round magazines. Slide locked to the rear of P1 Ultra shows how barrel thickens as it extends to tightly engage the slide when locked in battery. 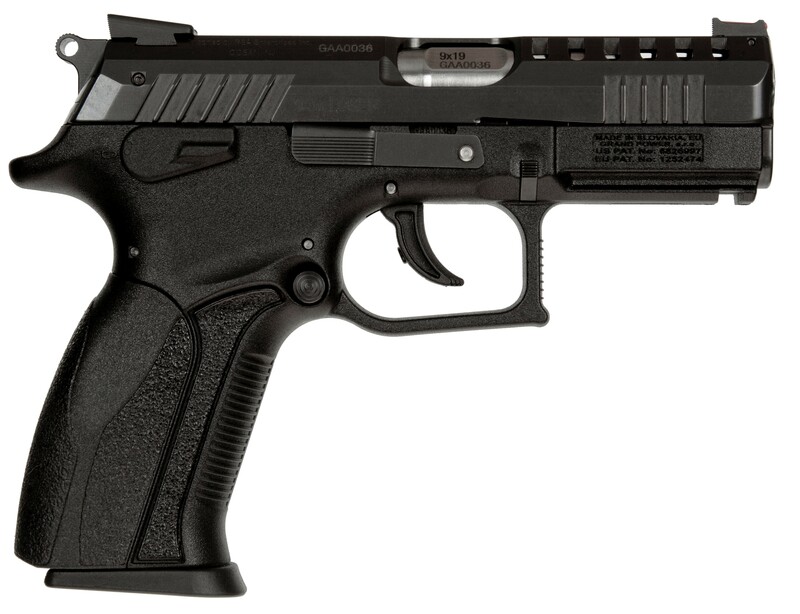 Certain features separate the P1 Ultra from other handgun designs. The barrel features a helical groove cut below the square block area of its hood section. This helical recess interfaces with a steel crosspin mounted inside the frame of the pistol. As the pistol is fired, the barrel and slide remain locked for a short distance until the crosspin rotates the barrel and brings the square block portion out of engagement with the slide. This method is similar in some ways to the Beretta Cougar, Beretta PX4 Storm, and Brugger & Thomet MP9 SMG, which all employ a variation of the rotating barrel lock design. Once the barrel and slide have moved back to the point where the barrel has twisted about 45 degrees, the slide is free to continue traveling back while the barrel’s travel is arrested by its interface to the frame via the barrel extension’s square shoulders. The feed ramp for the barrel is formed via the steel chassis located in the lower frame. As mentioned, this design allows a low bore axis relative to the shooter’s hand. P1 Ultra’s barrel is stainless steel and uses patented rotating lock method of operation. The 3.66-inch carbon-nitrided steel barrel features a helical groove cut below the square block area of its hood section that interfaces with a steel crosspin mounted inside pistol’s frame. The Grand Power Company’s P1 Ultra avoids the use of the transfer/locking block found in other rotating barrel designs such as the Beretta and B&T. 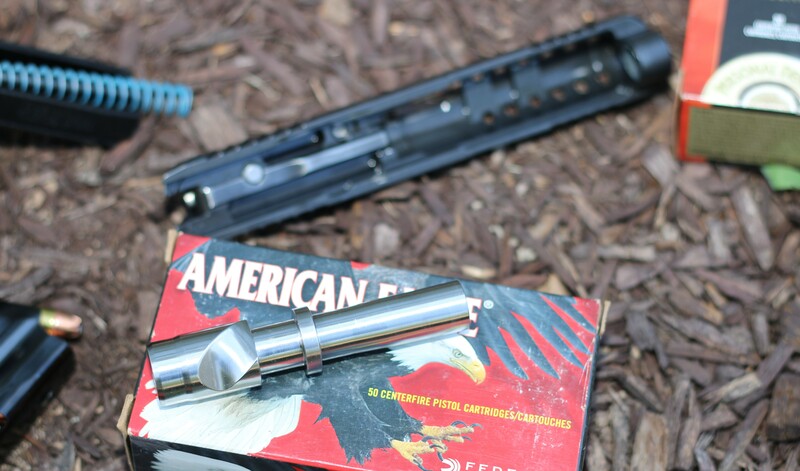 The Grand Power locking method features a square shouldered lock protruding from the otherwise round barrel, easily visible at the ejection port with the slide fully forward. This square shoulder is rotated in behind a solid column of steel running the length of the slide forward of the ejection port, and on the left side out of view, when the slide and barrel are fully forward in battery. While this “helical” method may sound complicated, it is not and even minimizes overall movement considering the barrel never leaves its original axis plane when a round is fired—an excellent point discovered during research that puts the rotating barrel design into perspective. The B&T MP9 uses the same basic locking mechanism. It is capable of 900 rounds per minute cyclic rate. In fact, some Grand Power K100 models feature two- and/or five-round burst capabilities available to Slovak special operation law enforcement. Many express dissatisfaction with the DA/SA trigger due to the difference experienced from breaking the first shot hammer-down carry mode to subsequent rounds in the magazine. The ability to carry the Grand Power Company Ultra “cocked and locked” eliminates this concern. Even if this is not the carry method and one carries with the hammer down, the P1 Ultra features one of the nicest DA/SA triggers experienced and will have many re-evaluating their blanket opinion of DA/SA handguns. The P1 Ultra has a very short reset in SA trigger mode, with minimal creep experienced. Once the trigger is mastered, which takes surprisingly little orientation training, the weapon is capable of firing multiple shot strings with the utmost accuracy. The P1 Ultra’s quality barrel and DA/SA trigger, combined with near perfect lock-up, ensure maximum reliability and accuracy. 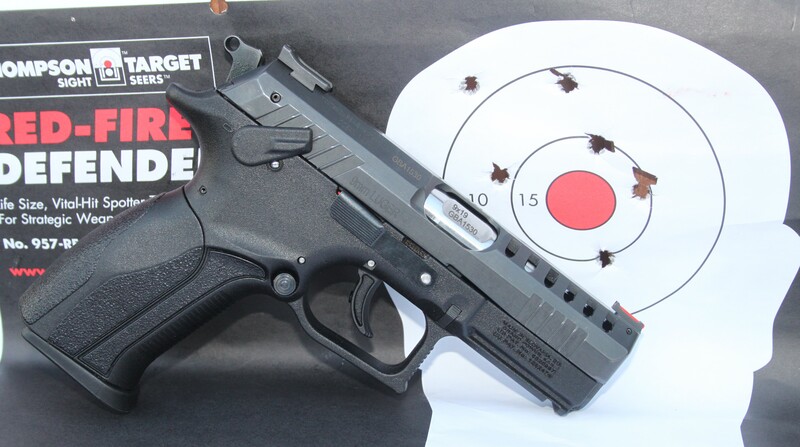 One-handed firing was no issue in terms of recoil or negatively impacting reliability. The evaluation was conducted at Echo Valley Training Center, a private range located near Winchester, Virginia, where many local and federal law enforcement tactical team members train. Fellow shooters at the range perked up when first exposed to the Grand Power Company P1 Ultra. Many confessed ignorance of the company, the handgun’s existence, or its history. We dedicated some time evaluating the P1 Ultra using several drills experienced during training with Graham Combat, Robert Vogel, Tactical Response, Storm Mountain, and other schools. 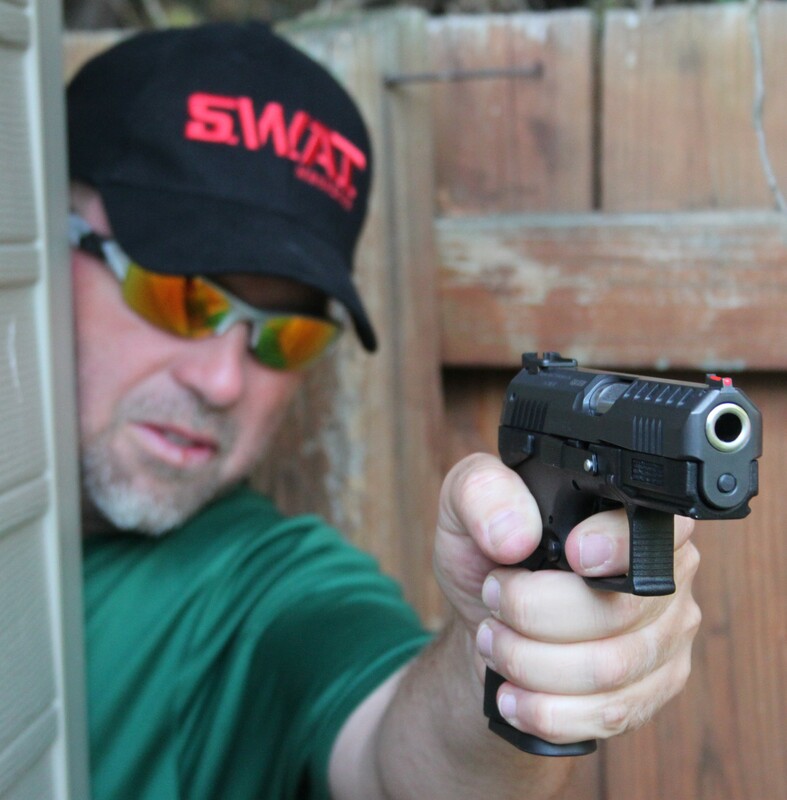 Drills included working around breaching facades, door entries, and other CQB activities typified by experiences encountered in shoot-house environments. A premium is placed on an accurate, quick-handling handgun such as the P1 Ultra, with multiple rounds fired in quick succession to put a target down. The natural pointability of the P1 Ultra comes into its own in this realm, and the P1 Ultra’s ergonomics and handling characteristics are quickly appreciated. The full-size grip frame and overall balance of the Grand Power P1 Ultra made felt recoil negligible. Some mention a “torquing” sensation when firing a handgun with a rotating barrel design. This was not noticed during this evaluation. 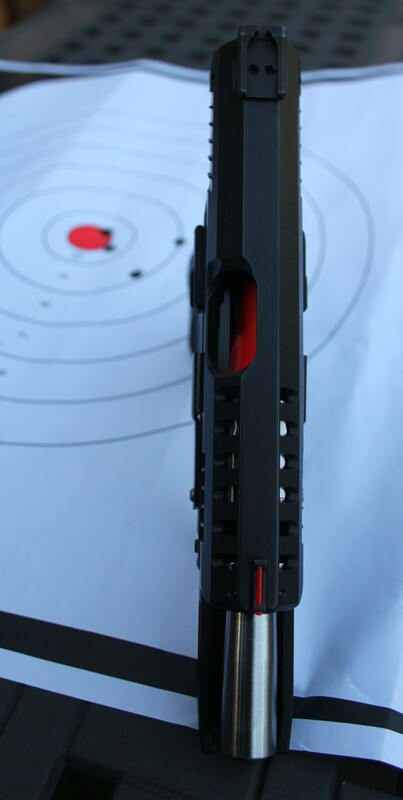 The P1 Ultra’s slide moved very smoothly, with the sights tracking effortlessly between shots fired. This would support why Grand Power’s weapons are winning so many European handgun matches. P1 Ultra proved reliable with a myriad of ammunition accessed for T&E. Black Hills, Federal, Hornady, and Winchester ammunition was used. 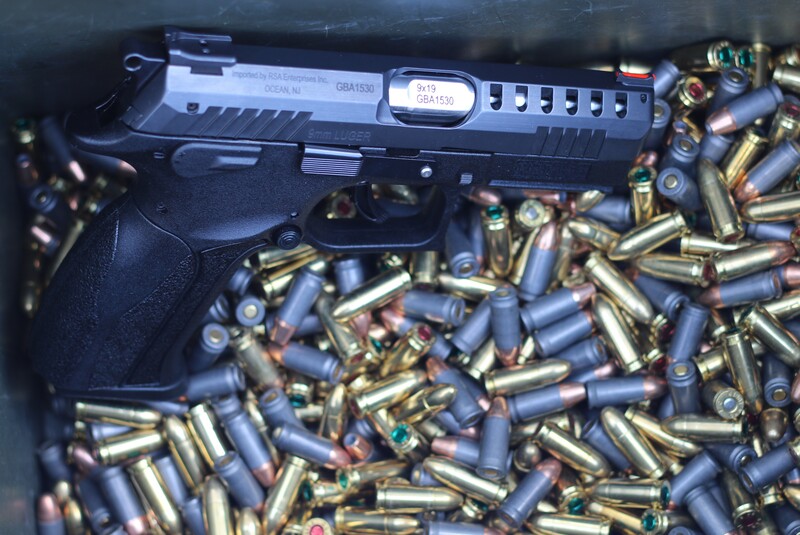 Loads fired spanned 115- to 147-grain, with hollow points and FMJ bullet types utilized. No malfunctions were experienced while firing over 500 rounds during range visits. 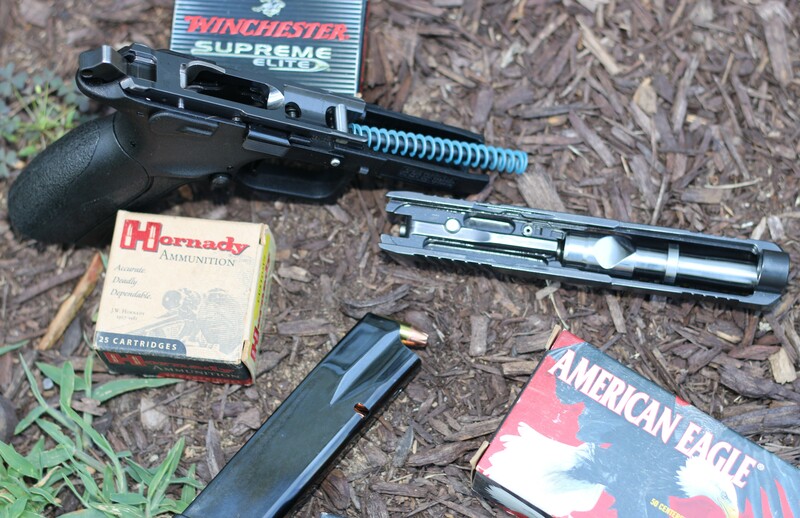 After a few runs orienting myself to the first-round DA trigger pull, first-round hits became the norm on the various Echo Valley Training Center steel targets, plate racks, and dueling trees. The Grand Power P1 Ultra did not disappoint, regularly producing 3.5-inch groups at 25 yards when fired from standing unsupported positions. Bench testing could not be resisted after witnessing the unsupported accuracy results. Two-inch groups at 25 yards were generated. Grand Power P1 Ultra imported via Eagle Imports is a solid design from Eastern Europe that gives U.S. consumers handgun alternatives. The advantages of the P1 Ultra’s single-action trigger became evident during the bench testing, where accuracy was the goal with its compact, minimal creep pull characteristics. Successful handgun designs constantly evolve on the market, for a variety of reasons stemming mainly from market and technological impulses and pressures. The Grand Power Company P1 Ultra is the poster child of this response to the marketplace. The key point with the P1 Ultra is that it is eminently adaptable to the individual—everyone from the competitor shooting in the “Production” class to the homeowner with a light/laser attached to its dust cover. The P1 Ultra arrives ready to go out of the box and is a potent package due to its accuracy, reliability, and capacity.